ISLAMABAD, Sept 6 (APP): Minister for Information, Broadcasting and National Heritage Senator Pervaiz Rashid Tuesday said that Pakistan was committed to extend moral, political and diplomatic support to the people of Kashmir. Pakistan, he said, believed that the solution to the dispute lay in abiding by the United Nations resolutions in accordance with the aspirations of the people of Kashmir. The minister was talking to a delegation of Kashmiri media persons here. Special Assistant to the Prime Minister Dr Asif Kirmani was also present on the occasion. Pervaiz Rashid termed the unleashing of terror by the Indian forces on innocent Kashmiris barbaric, saying such brutal acts could not silence their voice for their just cause of freedom and right to self-determination. He reiterated Pakistan’s determination to stand in solidarity with the Kashmiris, who were suffering at the hands of occupation forces. He urged the international community to take notice of the Indian atrocities and human rights violations, particularly in the context of firing pellets on innocent youth, children and women in occupied Kashmir. The supreme sacrifices rendered by the people of occupied Kashmir for their just cause of right to self-determination would not go waste, he added. Praising the role of Kashmiri media in highlighting the cause of Kashmir, Pervaiz Rashid said the government would utilize all its resources for the welfare and security of media persons and workers. 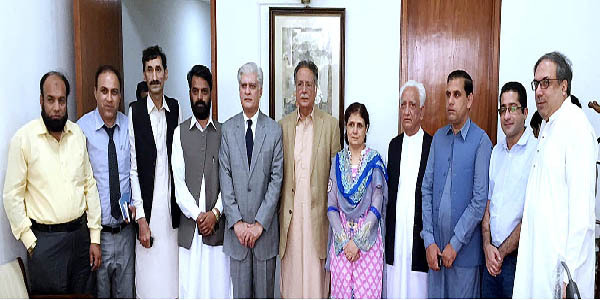 The delegation briefed the minister on various issues being faced by the journalist community and sought the minister’s assistance for their early resolution. The minister assured his full support to the members of delegation for the early resolution of their problems. He said the democratic government believed in freedom of expression and would continue to support the development and growth of media industry in the country.